Podnieks, who has put together over 50 hockey books now, offers a comprehensive text complete with in-depth interviews of every surviving player and a large collection colour photographs. Team Canada 1972 is the definitive look at the Summit Series 40 years later, still powerful, still resonating, still remarkable. With every living player contributing to the book with personal memories and thoughts of the series, this official publication provides fans with the most detailed and exciting look at the series. Brian McFarlane put out a similar book for the 30th anniversary. At 293 pages, Podnieks' version is more in depth. He retells the familiar story of the 1972 Summit Series events by letting the players' memories take center stage. All in all, if you are a well studied 1972 Summit Series fanthe narratives in this book are all a little too familiar. There are a lot of books on the 1972 Summit Series over the years, and with this being the 40th anniversary of the Super Series there is a whole slew more hitting bookshelves this fall. Podnieks new book does not offer a lot of new light on the series. The real value lies within some of the players' direct interviews. 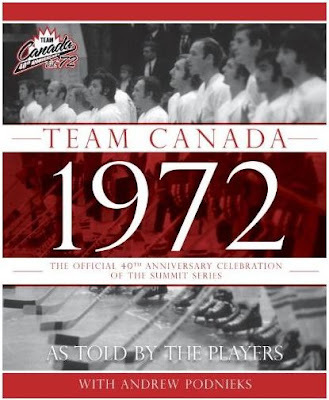 If you are looking for a nice combination of coffee table photo book with detailed written history of the 1972 Summit Series, Team Canada 1972 is a fine choice.